The International One Design was developed in the 1930’s by Corny Shields as an affordable club racer. It quickly grew in respect and popularity across the sailing community, and it served as the benchmark for many subsequent designs. IOD deservedly became the first boat recognized by ISAF in it’s ‘Classic Yacht Division.‘ When Trudeau ONE launched in July 2010 I wrote much about the history and legend of the International One Design class, and admiration for those great boats was a big part of the ONE WORLD Regatta that kicked off later that year. The final version of Craig’s boat hit the water only a couple days ago, so I’m still looking it over. I’ll have a lot more to say in the upcoming weeks, so consider this post just a “first look.” Maybe its just first-date infatuation, but so far I think the Teleri looks pretty nice! 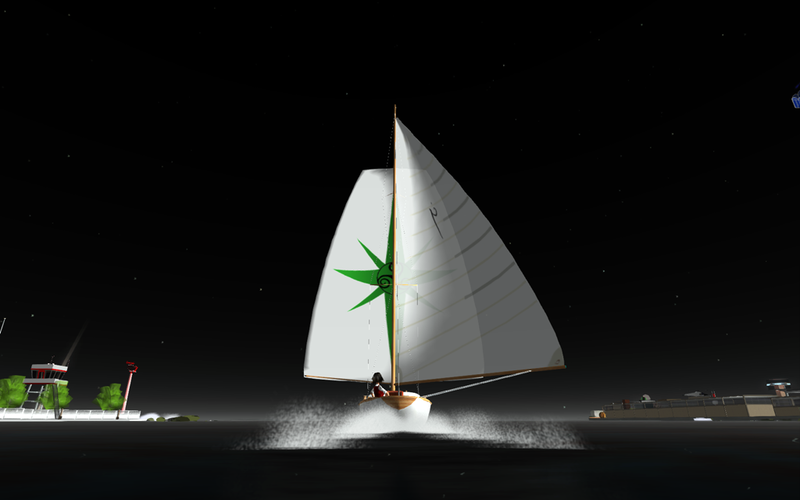 The Teleri follows a classical construction layout that should be familiar to many sailors. It is a single-masted sloop with a 3/4 fractional Bermuda rig and a full keel, and it borrows heavily from the IOD in real life. It’s powered by a highly modified BWind engine, and it can be sailed solo by a skipper or with the assistance of up to two crewmembers. I’ll tell you more about those features below; let’s first look at the build! 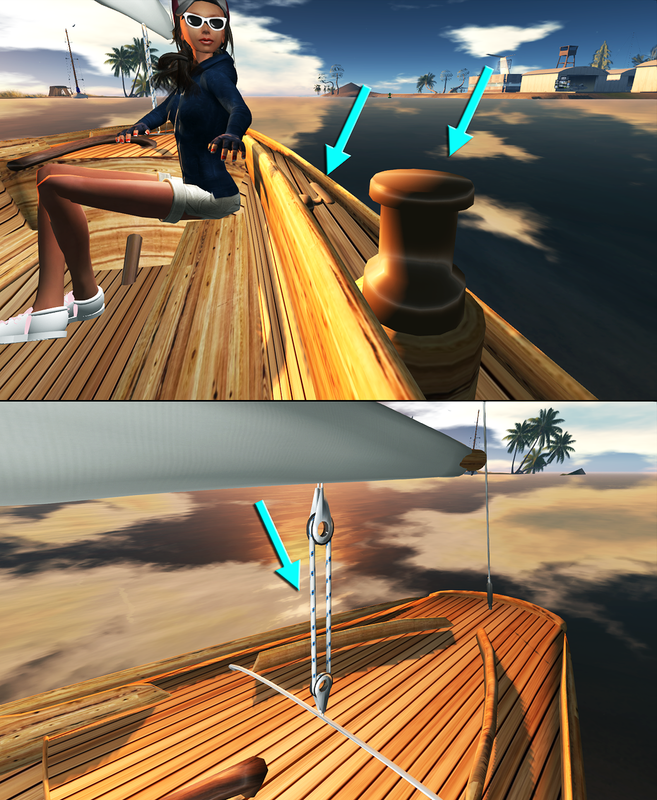 Boats with sculpted hulls often exhibit a mismatch in SL between the visible boat you can see and the underlying shape of the sculpted prims that make them up. This isn’t a big deal on a casual cruise, but it can result in confusion and serious problems when sailing in a crowded, “high-performance” race fleet. Invisible parts of the boat can cause collisions, hit marks, or even trigger race lines inadvertently. In the image below I got distracted and hit the dock in Knaptrackicon. Even that accident makes my point: The arrows below show how closely the hull forequarters line up against the dock and wedge against a moored boat. 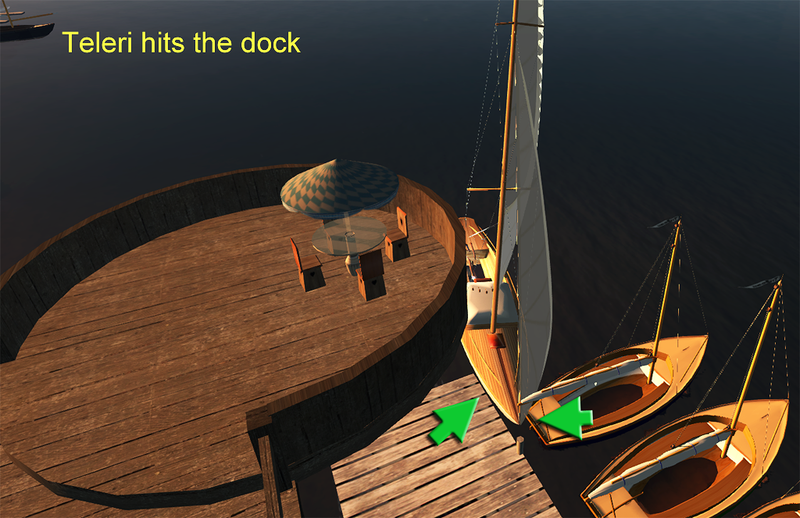 This same collision accuracy happens with the boom and sails. 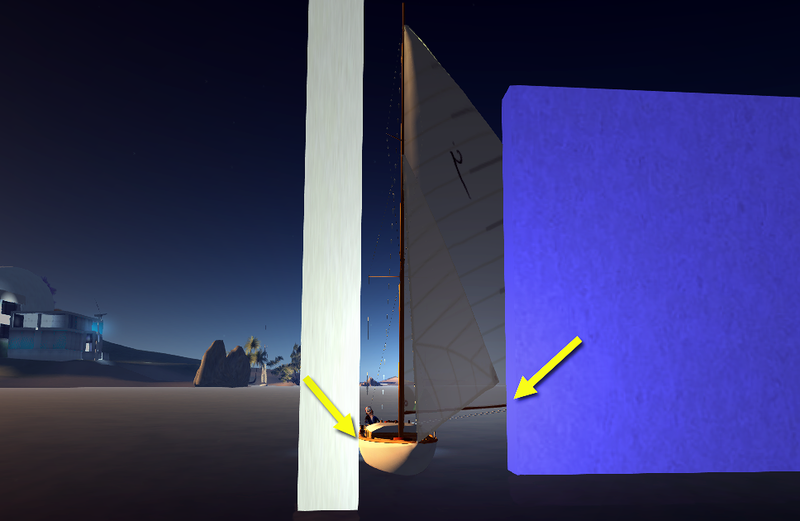 The figure below shows side and vertex views of my boat sailing downwind into a wall. The boat comes to rest on contact points located on the jib and mainsail convexity. Let me make this point once again below. 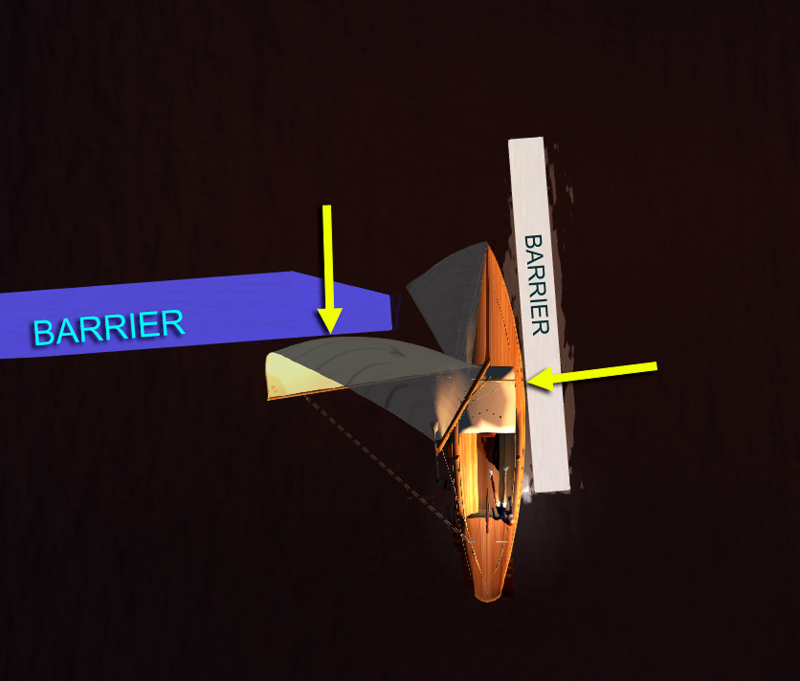 In this example I tried to sail my Teleri through a narrow opening between two barriers. The boat stops dead in the doorway, with the starboard hull pressed up against the white wall, and the mainsail hitting the purple wall. However, the boat will slide on through if the skipper sheets the sail tightly enough to fit. In the Solstice Challenge Regatta that just finished, much discussion went into protest disputes over “room at a mark” and problems associated with phantom sails and bowsprints. Mesh construction may help solve these SL-specific issues, and make virtual race boats more realistic. 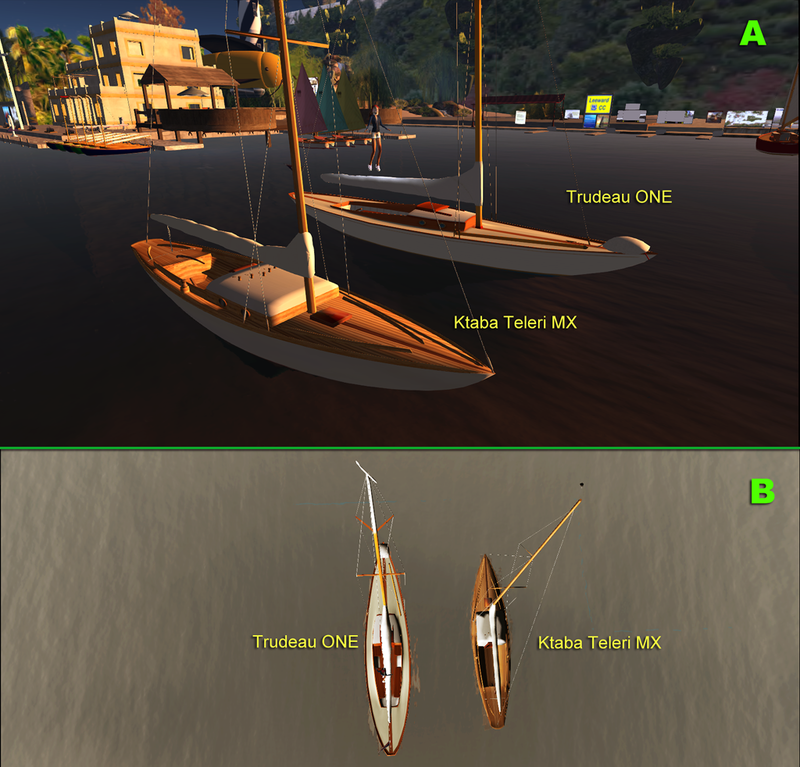 As for the Ktaba Teleri MX, the boat you see is the boat you get when sailing. Sailing vessels are more than just a hull, though, and Craig took his time with this boat; it shows in the quality of the detailing. The Teleri MX is built around the BWind engine, but Craig Ktaba’s spent considerable time tinkering with it and adding new features. I’m still going through the list of features and trying them all out, so I can only give you the highlights today. If you choose WWC, the boat will look for race wind in competition mode; it does not use WWC cruise settings. Once you have the correct wind loaded in the WWC, you’ll need to say ‘race start‘ to have the setter broadcast that wind to your boat. For its part, the boat has a simple dialog display that pops up when it senses WWC wind, so you’ll always know what’s going on. Here’s a simple plot of boat speed v. real wind angle, using that ‘default’ wind of 16.5kts. As you can see, the boat has a fairly smooth response curve. Teleri is dead in irons below RWA 30, but then quickly picks up speed as the boat falls off to close haul and the sails fill. 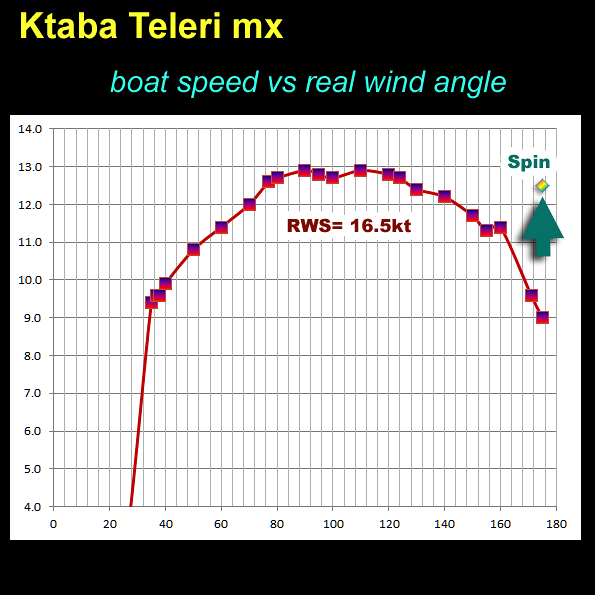 At RWA 40 the boat speed is 60% of real wind speed, and Teleri then maxes out on a beam reach with a boat speed roughly 80% of RWS. On far downwind points of sail (RWA >160) the performance deteriorates, but the spinnaker nicely compensates for that, as shown above. It’s worth commenting that Teleri has a strong weather helm. 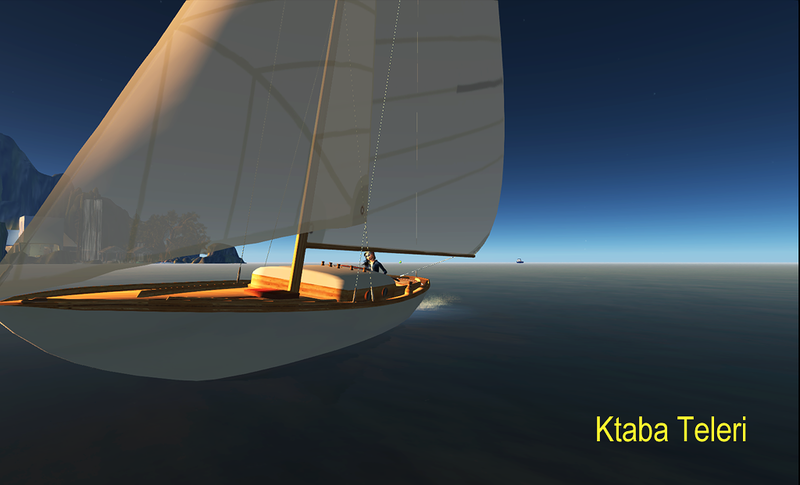 If you let go of the tiller on many RL sailboats, the boat will slowly turn to face the wind, and Craig Kbata’s intentionally built that effect into Teleri. The only other boat I’m aware of in SL that has a weather helm is the New York 30; the rest are either neutral or have a Lee bias. 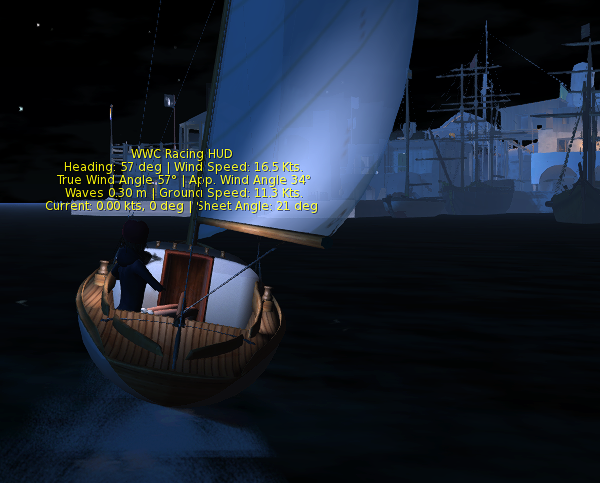 The Teleri has both simple and full hud displays that should be familiar to any Bwind sailor. 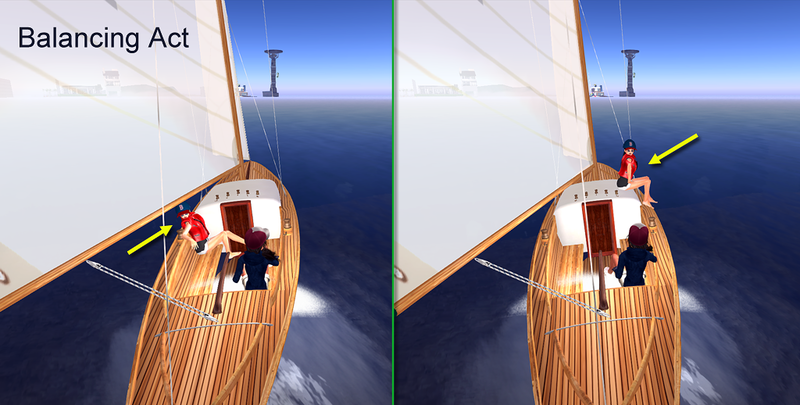 In this case, the HUD tells you if you are using racing or cruising wind, as well as the essential real and apparent wind parameters. Since the boat is fully WWC compliant (except for cruise wind), the HUD also displays wave and current information. When you add crew, the HUD display changes too. The crew can adjust the headsails, so the new HUD includes separate sheeting information for the main and jib (or spinnaker). 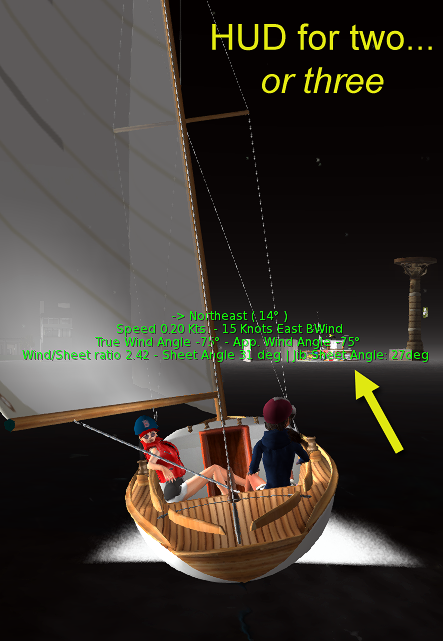 It also includes a readout of the wind/sheet ratio, so all aboard can keep sails correctly trimmed. The Taleri comes with three sails: a main, jib and spinnaker. When a skipper is sailing solo, the main and jib move together and the sails autogybe to the apparent wind. Over AWA 130 a sailor may choose to wing the jib to get an extra boost, and over AWA 145 you have the option to raise the spinnaker. The spinnaker angle is automatic for a solo skipper, and it conveniently auto-douces with AWA <145. Once you add crew, things change a bit. A single crew member takes charge of the headsails, and they move independent of the main. If you have two crew aboard, one gets the jib and the other gets the spinnaker. There’s no free ride on this boat! 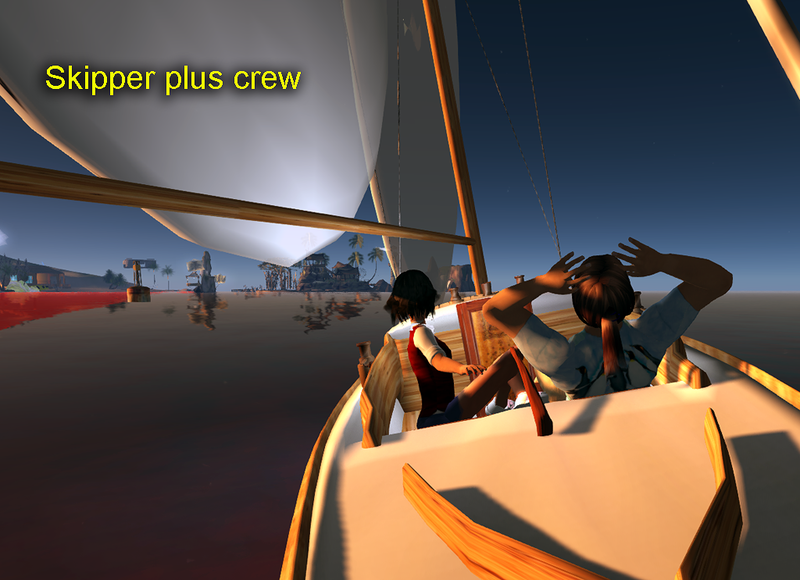 As I just mentioned, the Teleri can carry two crew in addition to the skipper, and the crew control the headsails. They can also switch positions to optimize the heel angle and maximize boat speed under different conditions. This can get a little complicated, since the boat is fastest with moderate heel, and all sailors automatically switch sides when the boat gybes. I haven’t tested the effect of crew position on boat performance yet, but it will be fun to compare it to the recent Trudeau line and upcoming Quest boats to see how well it works! The Teleri MX is Craig Kbata’s first production boat release, and it’s a great start. The Teleri is a mesh-constructed BWind racer that pays homage to the great International One Design vessels of the 1930’s. Although relatively small in size, the Teleri detailing is impressive and the feature list is long. It has non-phantom, luffing sails and a spinnaker for an extra downwind kick. The boat is fully WWC compliant (almost), and it has options to share sailing responsibilities with two extra crew. This entry was posted in BWind, Kbata 20, Sailboats. Bookmark the permalink. What I particularly like is its realistic size. I hope this will make many sailors rethink their avie’s size. BTW, the boat is available from Craig’s vendor in the TrYC clubhouse! 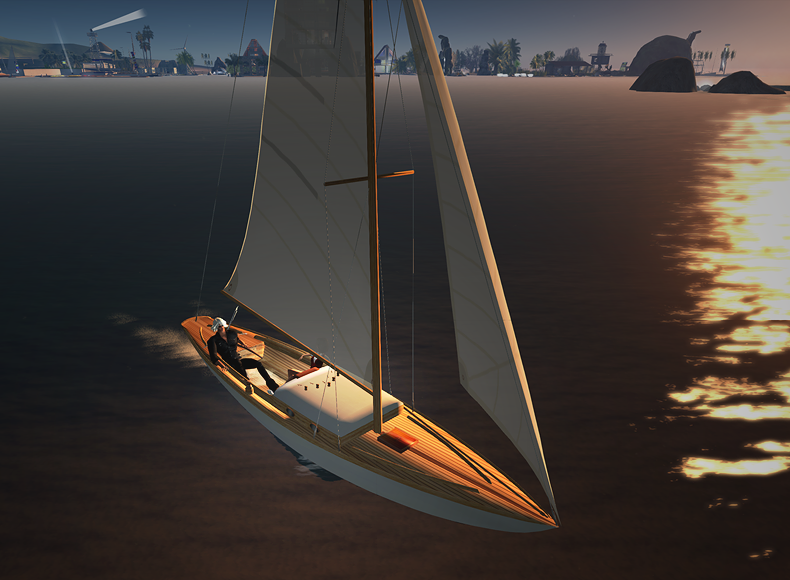 Will use the Teleri for tomorrow’s LCC cruise. Jane, what would you suggest for cruising: BWind or WWC? BWind is built-in and easy to use, but it also includes a North-South current of 2.0kt and fixed waves. I like to adjust those things myself, or just take the wind recommended for the fleet. That requires a WCC at the launch site. Forgot about WWCs depedancy on a windsetter and much too lazy to use my handheld. I do think this is an example of where ‘realism’ doesn’t always work in SL. I agree with Alain & Qyv that absent modified helm to closer model RL a weather helm in SL is mostly a nuisance. 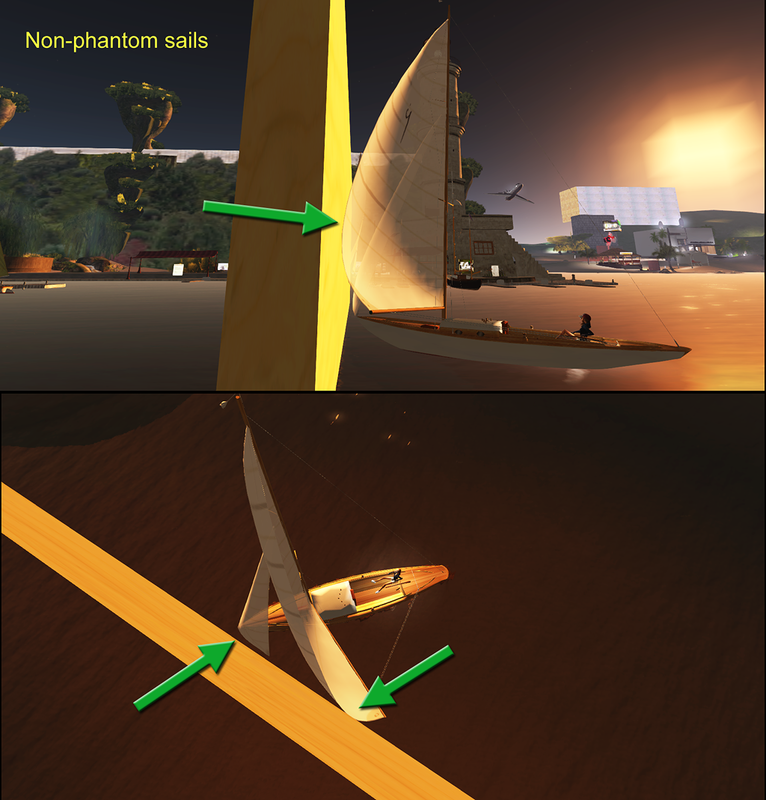 In RL one can hold the rudder at a fixed angle part way between mid-ships and full rudder, and so balance the boats natural weather helm (plus / minus whatever from poorly balanced sail trim). In SL we can’t usually do that. If Craig was to implement that – Great! But I know how zealous he is to keep the scripts light and this may not be the highest priority. Regarding wind… “professional cruiser”? Sounds a bit like ” perpetual student”. But seriously, Orca is right, for the solo sailer BWind is great. For races, with all that implies, a more “centralized” approach is needed. Club Cruises, not sure where they fit in the spectrum. And Orca, my goal is to get to a WWC setter that you, and others of your ilk, are happy to use. (/me wonders how long that will take. Lol).